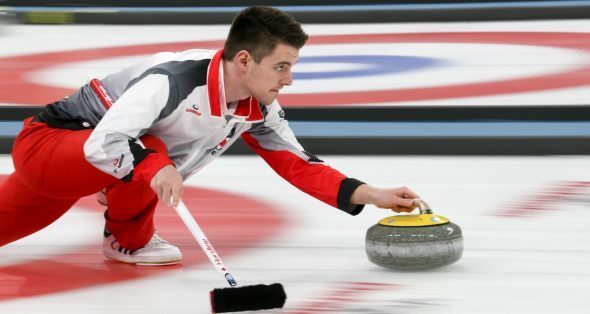 Brothers Tyler and Jordan Tardi, along with the rest of the Canadian Men’s Curling Team, won gold in Aberdeen, Scotland on March 10. They defeated the Scottish team in a nail-bitingly close 6-5 game in the final round of the World Junior Curling Championship. In addition to being world-class curlers, the Tardi brothers are also students at Kwantlen Polytechnic University. Tyler is in his second year of studying business entrepreneurship and Jordan is in his fourth year of studying drafting and design. This year’s victory is even more remarkable due to the events of last year’s World Junior Championship competition, when the Canadian Men’s Team failed to qualify for the playoffs. “To come back and kind of redeem ourselves … was a little extra special. It was probably the top moment of my life so far,” says Tyler. The competition this year was fierce as the team from Scotland was undefeated in the previous nine-game round robin tournament leading into the playoffs. There were 10 teams in the final pool, which led to the Canadian Men’s Team competing in nine separate games. Tyler says that there was no clear front-runner leading into the semifinals, as all the teams were capable of winning. The familial bond on their team extends beyond the Tardi brothers. Their parents, Paul and Anita Tardi, are also the coach and the team manager, respectively. Tyler says that his father curled the most while he and his brother were growing up and that watching him play inspired them. Jordan adds that, when they were finally old enough, he and Tyler entered a junior curling league program as soon as they could. According to Tyler, their father is less strict than many other coaches and likes to take a “relaxed approach” towards his teaching. Paul Tardi has been coaching his sons for the last 10 years, and his athletic skills, knowledge of the sport, and relationships with professional curlers has given the team a competitive edge. The Tardi family is overjoyed to have won gold together. Even though one of his teammates is his brother and his parents are his coaches, Tyler says that his entire team still feels like his family. For both brothers, merely representing Canada was an incredible honour. Tyler says it’s always a positive experience for a curler to wear the maple leaf, as Canada is one of the most prominent nations in the sport. “There’s a whole lot more that you’re representing, not just Canada, but you’re representing yourself, your school, your friends, everything,” he says. A few weeks after the competition, Tyler says the emotions from the World Junior Curling Championship are still fresh. “It’s one of those feelings where you don’t really know how to put it into words [because] it’s just so many emotions running through your head—sadness that it’s over, happiness that you finally achieved that, [and] disbelief [because] it’s been your biggest dream for all these years,” says Tyler.